If you like to play school or home school your children, customizing some of the worksheets can make a lesson FUN! Incorporate their interests and hobbies and by all means add a bit of humor to it all! Go ahead and copy the text below into a document, format if needed and print at home. Depending on skill level, they would work well for students in grades 1-3. TIP: Some of the questions are meant to be irrelevant but amusing. Kids need to be able to pull the important information and numbers out of the text to organize their thoughts. Directions: Answer each question based on the information in the stories. If you do not have enough information to answer the question accurately, write “Not enough information”. The apatosaurus eats stones to help grind up food. 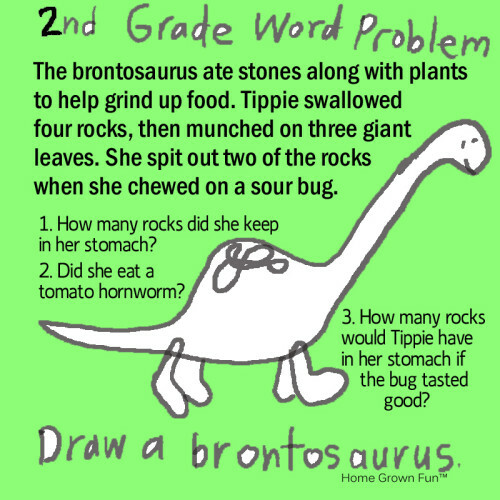 An apatosaurus named Tippie swallowed four rocks, then munched on three giant leaves. She spit out two of the rocks when she chewed on a sour bug. How many rocks did she have in her stomach? Did she eat a tomato hornworm? How many rocks would Tippie have in her stomach if the bug tasted good and she didn’t spit anything out? Draw a apatosaurus named “Tippie”. Did you know that a brontosaurus is not a real dinosaur? It was based on the apatosaurus. There was a big herd of triceratops in the backyard! Each one had three horns on its head. Horns are pokey and can put a hole in the trampoline. How many triceratops are there in the backyard if you can count nine horns? How many times can a triceratops jump on the trampoline without feeling dizzy? One of the triceratops jumps on the trampoline and gets stuck. One of his friends from down the street comes to help get him loose. How many triceratops are in our backyard? How many horns are in the backyard if two more triceratops visit from out of town? Draw a triceratops on the trampoline! We invited a stegosauruses to lunch. We walked to a nice café down the street. It seemed that the inside was too small for him so we decided to sit in the parking lot. Each parking space was 20 feet long. The body of our stegosaurus friend was 15 feet long and his tail was 10 feet long. Was the parking space big enough for our friend? If the waiter told us that we could sit on the patio if the stegosaurus kept his body on the chair and his tail on the sidewalk, how long would the chair need to be? When we got our food, the stegosaurus looked at his hamburger and said: “____________________________”. Why did he say that? A big bus pulled up to the café and parked next to our stegosaurus friend. The bus and the dinosaur were the same size. How long was the bus? Draw a stegosaurus sitting with you at a cafe enjoying a big bowl of lettuce! 3. “I don’t eat meat” would be a good answer if the student knows a bit about that particular dinosaur. If the student does not know that the stegosaurus is a plant eater, then the appropriate answer would be “Not enough information”.